Clermont-Ferrand is a city in France. It has about 143,000 inhabitants. 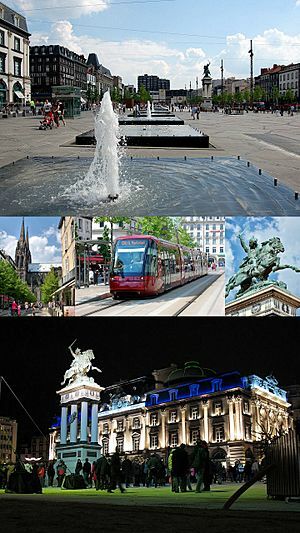 Clermont-Ferrand (in Occitan Clarmont-Ferrand / Clarmont of Auvèrnhe) is a city in central-southern France, prefecture of the department of Puy-de-Dome and chief town of the Auvergne region. Partly for historical reasons, the city is often called the "Clermont". It is officially the 23rd city in France with 143,000 inhabitants in 2010. It is at the heart of a conurbation of nearly 300,000 inhabitants. With 463,891 inhabitants in 2010 according to INSEE, the urban area has the 17th and 12th of urban France. Clermont-Ferrand Facts for Kids. Kiddle Encyclopedia.